Your child has been begging for a Facebook page and you have finally decided you are ready to let them have one. The thought of them having their own account can be overwhelming and it can be difficult to know where to start. Everyone wants their children to be safe on the internet and in order to get them started its important you tread lightly. Below are simple steps you can take as part of digital parenting in order to prepare your child for their first Facebook page. Keep it only family – It is important that in the beginning children keep their page with only family and close friends on their 'friends' list. This will lower the risk of cyberbullying. Teach them about cyberbullying – Let them know that cyberbullying is not ok and to let you know if anyone is harassing them on the internet. This will also let them know that it is not ok to do it to others. Know your child’s password – This way you can keep track of not only their page but also any inbox messages and friend requests they may receive. Keep the pictures to a minimum – Keep the amount of pictures low in the beginning. Just a few is sufficient. You can always add more later. Keep profile private instead of public – Keep it private so that only people on their friends list can see their pictures and what they post. These tips can have you prepared for your child’s first encounter with Facebook. Once your child can show you that they are being responsible with their behavior on Facebook you can adjust some of these restrictions. For instance, you can let them add more photos or start adding their friends from school. Make sure that you are always on their friends list so that you can monitor their activity after you have let them change their password. Consider using a parental intelligence system as well so you can be notified if they are engaging in inappropriate or illegal online behavior. Now that you have some helpful tips as a guide you can let your child have the Facebook profile they have been begging for. Digital Parenting: Is My Child Ready For Twitter? 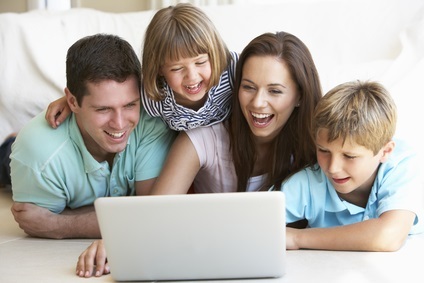 Digital Parenting: Should Kids Have Set Rules When Using Technology?